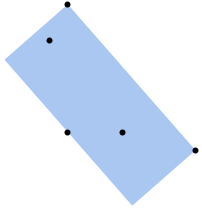 gives the minimal axis-aligned bounding box for the points pt1, pt2, …. gives a bounding region of type form. 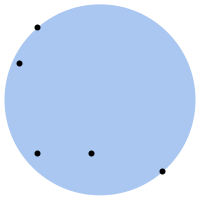 gives a bounding region for a MeshRegion or BoundaryMeshRegion. 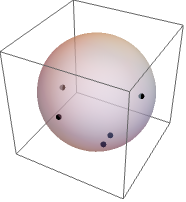 BoundingRegion is also known as enclosing region or circumscribed region. 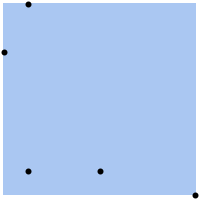 A bounding region for a set of points is a region such that . 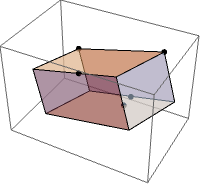 Optimal bounding regions typically minimize some property for the bounding region, such as the minimum area oriented rectangle. They generally take longer to compute. 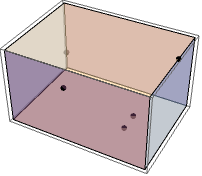 Fast bounding regions typically provide a bounding region quickly for a large number of points but may not provide the optimal bounding region, such as the minimum area oriented rectangle.